Overlord: Minions for the DS reminds me of a certain game where you have four different-colored playable characters that you guide with a stylus to work together to solve puzzles. Any guesses? If you said The Legend of Zelda: Four Swords Adventures, you're wrong. The developer drew inspiration for Minions from an old Blizzard game called The Lost Vikings (SNES, 1992). Like Vikings (and, uh, Four Swords), Minions makes use of all four players throughout the game to accomplish various tasks. The "Overlord" in the game is you – controlling all from on high with your mighty stylus. In this regard, Minions feels more like Overlord than the original game did. But beyond that, it's a whole different game. One that happens to resemble two other games. Overlord: Minions is a spin-off of the Overlord series for the DS – not a port says developer Carl Johnson. It's aimed at a slightly younger audience – 12 to 18 – and is meant to be a more compact experience than a sprawling epic. Each mission is only 20 minutes long, max and all of the motions are controlled with the stylus. I played 10 minutes of the first level, which apparently I wasn't supposed to see. The developer loaded me into a later level where I played for about five minutes before Codemasters event people called halt to all demos to make time for a presentation and I lost my place in line. The build was pre-alpha. The gameplay was mostly set, but graphics were basic and the text didn't seem to be finalized. Um, puzzles? : I can only hope that there's more to do in the game in later levels. The first level had absolutely nothing in it beside a few stylus-controlled sword-slashes; but what do you expect from a tutorial? That later level had me switching back and forth between two types of minion: the blue water-based minion had to cross streams and lower bridges for the brown brawler-class minion to cross and beat up various townspeople. Tutorial icon sensitivity: In the early levels, helpful purple question marks stand beside obstacles you haven't learned to master yet. I must have mashed on each like half a dozen times before the tutorial would actually show up – and by then, my stylus had invariably triggered whatever it was I was supposed to do for the obstacle. Hooray for puzzles: If you can't get a game to fit on a platform (*cough*port*cough*), you're better off building something from the ground up that works with the platform. 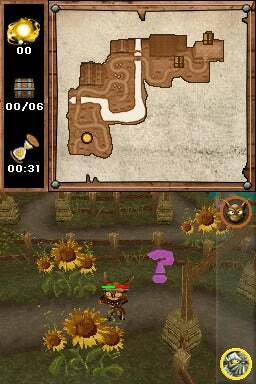 Puzzle games do well on the DS – and having shorter levels makes for an actual portable experience. I applaud the developer for crafting the game to fit the platform. Overlord: Minions is something I wouldn't play to satisfy my evil itch; even if the minions could pee on things, I bet the animation would be too subtle for me to see it. But, with a little more development and some decent game design, Minions could be my next commute-to-work game.